The ministry provides helps organize parish funeral receptions, prepare and cook food, set-up, and clean up the hall prior to and after funeral receptions. If you interested in getting involved in Bereavement Ministry or would like more information please contact Peggy Nelson by phone at (619) 442-1697 or email HERE. This ministry provides help for those in need of prayer for themselves or others. If you interested in getting involved in the Prayer Chain or would like more information please contact Nancy Adema by phone at (619) 442-1697 or email HERE. This ministry promotes respect for all human life from conception to natural death. If you interested in getting involved in the Respect Life Ministry or would like more information please contact Don Mercurio by phone at (619) 442-1697 or email HERE. For more information please visit www.usccb.org/about/pro-life-activities/respect-life-program. 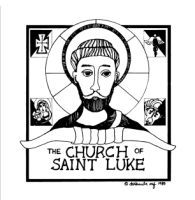 This ministry provides information about The Church of St. Luke and its various ministry and also makes new parishioners fell welcomed into the parish. If you interested in getting involved in the Welcoming Ministry or would like more information please contact Suzanne Levonian by phone at (619) 442-1697 or email HERE. This is yearly collection of school supplies for local elementary schools. If you interested in getting involved in the Back to School Drive or would like more information please contact Carlos and Patti Cuellar by phone at (619) 442-1697 or email HERE. This is a yearly event that is one of the largest in San Diego providing gifts and meals for needy families in El Cajon. If you interested in getting involved in the East County Christmas for Kids or would like more information please contact Dave Sapper by phone at (619) 442-1697 or email HERE. This is ministry coordinates an annual fundraising event to benefit all parish faith formation programs. If you interested in getting involved in Feeding America or would like more information please contact the Parish Office by phone at (619) 442-1697 or email HERE. This is a leading domestic hunger-relief charity in which our volunteers repackage and transport food to charitable agencies and local schools. If you interested in getting involved in Feeding America or would like more information please contact Carlos and Patti Cuellar by phone at (619) 442-1697 or email HERE. For more information please visit www.feedingamerica.org. A Youth Ministry-sponsored service project that encourages our parish families to share the spirit of giving by providing gifts to El Cajon families in need during the Christmas season. 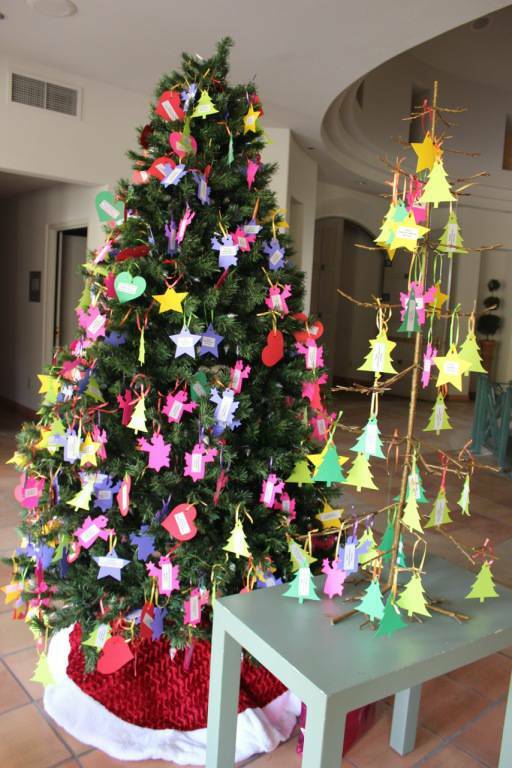 If you interested in getting involved in the Giving Tree or would like more information please contact Jane Alfano by phone at (619) 442-1697 or email HERE. These are various service projects to benefit the poor and needy in our community and world. This is an opportunity for volunteers with a welcoming personality and gifts of administration, typing, computer skills, and telephone etiquette to sign up for weekly shifts at various times throughout the work day to volunteer in the parish office. If you interested in getting involved in Office Volunteers or would like more information please contact the Parish Office by phone at (619) 442-1697 or email HERE. Provides food, beverages, hygiene products to our homeless and hospitalized Veterans of War. If you interested in getting involved in Operation Stand Down or would like more information please contact Carlos and Patti Cuellar by phone at (619) 442-1697 or email HERE. An Outreach service in support of Mama's Kitchen, a community-driven organization providing nutritional support to men, women, and children affected by AIDS or cancer and who are vulnerable to hunger. If you interested in getting involved in the Thanksgiving Food Drive or would like more information please contact the Joanie Maitilasso by phone at (619) 442-1697 or email HERE. This ministry coordinates blood drives four times a year at the parish. If you interested in getting involved in the San Diego Blood Bank or would like more information please contact Dave Sapper by phone at (619) 442-1697 or email HERE. For more information please visit www.sandiegobloodbank.org. This local chapter provides assistance to needy families and provides referrals to other agencies for specific needs. If you interested in getting involved in St. Vincent de Paul or would like more information please contact Pauline Doran by phone at (619) 442-1697 or email HERE. For more information please visit www.my.neighbor.org/how-we-help/st-vincent-de-paul-village. This organization provides education, support, and fundraising to benefit Alzheimer's research. If you interested in getting involved in the Alzheimer's Association or would like more information please contact Sonia Stepovich by phone at (619) 442-1697 or email HERE. For more information please visit www.alz.org/sandiego. This organization helps children reach their potential through professionally supported, one-to-one relationships with mentors that try to have a measurable impact on youth. In order to take part in this organization you must be over 18 years, have a 1 year commitment, and go through an interview process. If you interested in getting involved in Big Brothers/Sisters of SD or would like more information please contact the Parish Office by phone at (619) 442-1697 or email HERE. For more information please visit www.sdbigs.org. This organization is dedicated to helping San Diego youths develop leadership and confidence. This organization also provides children with disabilities assurance in living productive lives. If you interested in getting involved in the Christopher J. Collins Foundation or would like more information please contact Marty Collins by phone at (619) 442-1697 or email HERE. For more information please visit www.christopherjcollins.org. This organization provides medical, spiritual, and material support for unplanned pregnancy. If you interested in getting involved in Culture of Life Services or would like more information please contact Debbie Bradel by phone at (619) 442-1697 or email HERE. For more information please visit www.colfs.org. This is a transitional living project for homeless victims of domestic violence and their families. If you interested in getting involved in the El Nido Project or would like more information please contact Jane Alfano by phone at (619) 442-1697 or email HERE. This organization is committed to preventing Sudden Cardiac Arrest/Death (SCA/D) in young people through awareness education, and action. If you interested in getting involved in the Eric Paredes Save A Life Foundation or would like more information please contact Rihina by phone at (619) 442-1697. For more information please visit www.epsavealife.org. This organization is the largest rehabilitation program for the homeless in San Diego. Volunteers are needed in various programs such as food service or counseling. Orientation is required along with a minimum age requirement of 10 years. If you interested in getting involved in Father Joe's Village or would like more information please contact Dcn. Allan Williams by phone at (619) 442-1697 or email HERE. For more information please visit www.my.neighbor.org. This organization is a weekly prayer outreach project. If you interested in getting involved in God Box or would like more information please contact Lynn Neu by phone at (619) 442-1697 or email HERE. This organization brings prayer and Eucharist to those of our Catholic faith in the hospital or care facility. If you interested in getting involved in the Grossmont Hospital/Villa Las Palmas Communion Ministry or would like more information please contact the Parish Office by phone at (619) 442-1697 or email HERE. If you interested in getting involved in Grossmont Hospital Volunteers or would like more information please contact the Parish Office by phone at (619) 442-1697 or email HERE. For more information please visit www.sharp.com/hospitals/grossmont/volunteers.cfm. This organization supplies food to families in need in El Cajon. If you interested in getting involved in the Holy Trinity Food Pantry or would like more information please contact Ken Stempien by phone at (619) 442-1697. This organization raises scholarship funds for children with lower GPA who do not qualify for the upper division scholarships. If you interested in getting involved in the Hoover High Foundation or would like more information please contact Robert Guarnotta by phone at (619) 442-1697 or email HERE. This global organization is dedicated to changing the world one child and one community at a time. If you interested in getting involved in Kiwanis International or would like more information please contact Jim Cate by phone at (619) 442-1697 or email HERE. For more information please visit www.kiwanis.org. This organization empowers volunteers to serve their community, meet humanitarian needs, encourage peace, and promote international understanding. This organization is responsible for the annual eyeglass collection at the parish. If you interested in getting involved in the Lions Clubs International or would like more information please contact Kelly Sinclair by phone at (619) 442-1697 or email HERE. For more information please visit www.lionsclubs.org. This is a non-profit charitable organization that delivers food and support to San Diegan's affected by AIDS. If you interested in getting involved in Mama's Kitchen or would like more information please contact the Parish Office by phone at (619) 442-1697 or email HERE. For more information please visit www.mamaskitchen.org. This organization enhances the quality of life for elder San Diego residents providing appetizing, nutritious meals, support, and a warm friendly smile. If you interested in getting involved in Meals on Wheels or would like more information please contact the Parish Office by phone at (619) 442-1697 or email HERE. For more information please visit www.meals-on-wheels.org. This is a private, all-scholarship middle school in the Jesuit tradition dedicated to providing a rigorous college-prepatory education to young men and women of low income families who will be the first in their families to graduate from college. If you interested in getting involved in the Nativity Prep Academy or would like more information please contact the Randall Sanner by phone at (619) 442-1697 or email HERE. For more information please visit www.nativityprep.org. This organization supports educational awareness and fundraising for research to find a cure to Ovarian Cancer. If you interested in getting involved in Nine Girls Ask or would like more information please contact Lynn Neu by phone at (619) 442-1697 or email HERE. For more information please visit www.ninegirlsask.org. This organization provides residential homes and services for adults with developmental disabilities. If you interested in getting involved in Noah Homes or would like more information please contact Kay Krueger by email HERE. For more information please visit www.noahhomes.org. This organization is a network of care and resources. If you interested in getting involved in Outreach to the Sick and Dying or would like more information please contact Lynn Neu by phone at (619) 442-1697 or email HERE. This organization builds cross-culture awareness with Turkish Muslim Americans. For more information please visit www.pacificainstitute.org. This organization visits prisoners and inmates for spiritual services and counseling, a background check and training are required. If you interested in getting involved in Prison/Detention Ministry or would like more information please contact Dcn. Allan Williams or Dan Cannon by phone at (619) 442-1697 or email HERE. This organization raises money through various fundraisers to benefit St. Jude's. If you interested in getting involved in Saint Jude's Children's Research Hospital or would like more information please contact Carlos and Patti Cuellar by phone at (619) 442-1697 or email HERE. For more information please visit www.stjude.org. For more information please visit www.sharp.com/services/hospice. This is an annual athletic competition for children and adults with intellectual disabilities. If you interested in getting involved in the Special Olympics or would like more information please contact Jim Cate by phone at (619) 442-1697 or email HERE. This organization brings together cancer survivors to share their stories with medical students, doctors, and nurses. If you interested in getting involved in Survivors Teaching Students or would like more information please contact Lynn Neu by phone at (619) 442-1697 or email HERE. For more information please visit www.ovariancancer.org/get-involved/survivors-teaching-students-sts. This organization provides food for military families in need. For more information please visit www.vvsd.net. For more information please visit www.redcross.org. For more information please visit www.usccb.org/cchd. For more information please visit www.crs.org. For more information please visit www.catholicvolunteernetwork.org. For more information please visit www.fairtradeusa.org. For more information please visit www.habitat.org. For more information please visit www.heifer.org. For more information please visit www.guidinghands.org. For more information please visit www.specialolympics.org. For more information please visit www.unicef.org. For more information please visit www.worldwildlife.org. If you are involved in an organization and would like to be included as a contact in our online directory, please call the Parish Office at (619) 442-1697.